On 17 March 2008, the Council adopted Regulation (EC) No 242/2008 (1) concluding the Fisheries Partnership Agreement between the Republic of Côte d'Ivoire and the European Community (2) (the ‘Agreement’). The Agreement was then tacitly renewed and is still in force. The last Protocol to the Agreement expired on 30 June 2018. The Commission has negotiated, on behalf of the Union, a new Protocol implementing the Agreement (the ‘Protocol’). The Protocol was initialled on 16 March 2018. The objective of the Protocol is to enable the Union and the Republic of Côte d'Ivoire (‘Côte d'Ivoire’) to work more closely on promoting a sustainable fisheries policy, sound exploitation of fishery resources in Ivorian waters, and Côte d'Ivoire's efforts to develop a blue economy. The Protocol should be signed. The signing on behalf of the Union of the Protocol on the implementation of the Fisheries Partnership Agreement between the European Union and the Republic of Côte d'Ivoire is hereby authorised, subject to the conclusion of the said Protocol. The text of the Protocol is attached to this Decision. The President of the Council is hereby authorised to designate the person(s) empowered to sign the Protocol on behalf of the Union. In accordance with Article 13 of the Protocol, the Protocol shall be applied on a provisional basis as from the signature thereof, pending the completion of the procedures necessary for its entry into force. (1) Council Regulation (EC) No 242/2008 of 17 March 2008 on the conclusion of the Fisheries Partnership Agreement between the European Community and the Republic of Côte d'Ivoire (OJ L 75, 18.3.2008, p. 51). (2) OJ L 48, 22.2.2008, p. 41. These fishing opportunities target fishing for highly migratory species (species listed in Annex 1 to the 1982 United Nations Convention), with the exception of species which are protected or prohibited in the framework of the International Commission for the Conservation of Atlantic Tunas (ICCAT) or other international agreements. 2. Paragraph 1 shall apply subject to Articles 5 and 6 of this Protocol. 3. Vessels flying the flag of a Member State of the European Union (the ‘Union vessels’) may engage in fishing activities in the Ivorian fishing zone only if they are in possession of a fishing licence for that zone under this Protocol. The Republic of Côte d'Ivoire (‘Côte d'Ivoire’) undertakes to exchange information relating to any agreement authorising access to other foreign vessels in its fishing zone, in particular the number of authorisations issued and catches made, in accordance with Article 11 of this Protocol. Côte d'Ivoire shall also provide data on the fishing effort of Ivorian tuna vessels with an industrial fishing licence. 1. The financial contribution referred to in Article 7 of the Agreement shall be EUR 682 000 per year, or a total of EUR 4 092 000 for the period referred to in Article 1.
a specific annual amount of EUR 352 000 for the first two years of application of this Protocol and EUR 407 000 for the following years, the purpose of which is to support the implementation of the sectoral fisheries policy in Côte d'Ivoire. 3. In addition, vessel owners shall make an annual financial contribution estimated at EUR 330 400 for access to the Ivorian fishing zone in accordance with the arrangements laid down in Chapter II of the Annex to this Protocol. 4. Paragraph 2 of this Article shall apply subject to Articles 4, 5, 6 and 9 of this Protocol and Articles 12 and 13 of the Agreement. 5. If the overall quantity of catches by Union vessels in the Ivorian fishing zone exceeds the reference tonnage, the amount of the annual financial contribution shall be increased by EUR 60 for each additional tonne caught during the first two years of application of this Protocol and by EUR 70 for the following years. However, the total annual amount paid by the Union shall not be more than twice the amount indicated in point (a) of paragraph 2. If the quantities caught by Union vessels exceed the quantities corresponding to twice the total annual amount, the amount due for the quantity exceeding that limit shall be paid the following year. 6. Payment of the financial contribution laid down in paragraph 1 shall be made no later than 90 days after the date of provisional application of this Protocol in the first year and no later than the renewal date of this Protocol in the following years. 7. The Ivorian authorities shall have full discretion regarding the use to which the financial contribution referred to in point (a) of paragraph 2 is put. 8. The financial contribution referred to in point (a) of paragraph 2 shall be paid to the Public Treasury of Côte d'Ivoire. 9. The financial contribution referred to in point (b) of paragraph 2 shall be paid into a dedicated account for the implementation of sectoral support opened with the bank of the Public Treasury of Côte d'Ivoire. The Ivorian authorities shall notify the Union of the relevant bank account numbers on an annual basis. Each of these financial contributions shall be included in the State budget and shall be subject to the Ivorian public finance management rules and procedures. supporting the blue economy and developing aquaculture. the criteria and procedures used for evaluating the results obtained, on an annual basis. 3. Any proposed changes to the multiannual or annual sectoral programme or to the use of the specific amounts for the initiatives to be carried out shall be notified in advance to the European Commission and be approved by the two Parties within the Joint Committee, where appropriate by exchange of letters. 4. Each year, the Parties shall carry out an evaluation within the Joint Committee of the progress made in implementing the multiannual sectoral programme. Where this evaluation indicates that the achievement of the objectives of the financial contribution of Article 3(2)(b) is not in line with the programming or where the implementation of the financial contribution is deemed insufficient by the Joint Committee, the contribution may be reviewed or suspended. Payment of the financial contribution shall resume after consultation and agreement by both Parties when the results of the implementation of the sectoral support comply with the programming adopted by the Joint Committee. The two Parties shall continue to monitor the sectoral support until the specific financial contribution provided for in Article 3(2)(b) has been used up, if necessary after this Protocol expires. However, except in cases of force majeure, this specific financial contribution may not be paid out beyond a period of six months after this Protocol expires. 1. The Parties hereby undertake to promote responsible fishing in Ivorian waters on the basis of the principle of non-discrimination between the different fleets fishing in those waters. 2. During the period covered by this Protocol, the Union and the Ivorian authorities shall cooperate on monitoring the evolution of catches, the fishing effort and the state of fisheries resources in the Ivorian fishing zone. 3. The Parties undertake to promote cooperation at subregional level on responsible fishing, in particular, within the International Commission for the Conservation of Atlantic Tunas (ICCAT) and any other subregional or international organisation concerned. The Parties undertake to comply with all ICCAT recommendations. 4. In accordance with Article 4 of the Agreement and on the basis of the recommendations and resolutions adopted within the ICCAT, and in the light of the best available scientific advice, the Parties shall consult each other within the Joint Committee and adopt, where appropriate after a scientific meeting, measures to ensure the sustainable management of fisheries resources affecting the activities of Union vessels. 5. The Parties shall work together to strengthen the mechanisms for control, inspection and the combating of illegal, unreported and unregulated fishing in Côte d'Ivoire. 1. The fishing opportunities referred to in Article 1 may be increased by mutual agreement provided that the consultations referred to in Article 5(4) confirm that such an increase will not endanger the sustainable management of the resources of Côte d'Ivoire. In this case the financial contribution referred to in Article 3(1) shall be increased proportionately and pro rata temporis. 2. Conversely, if the Parties agree to adopt a reduction in the fishing opportunities provided for in Article 1, the financial contribution shall be reduced proportionately and pro rata temporis. 3. The allocation of the fishing opportunities among different categories of vessels may also be reviewed, following consultations and by mutual agreement between the Parties, provided that any changes comply with recommendations made at the scientific meeting referred to in Article 5(4) regarding the management of stocks liable to be affected by such redistribution. The Parties shall agree on the corresponding adjustment of the financial contribution where the redistribution of fishing opportunities so warrants. 4. The Joint Committee may, where necessary, examine and adapt the technical conditions governing fishing activities and the rules for the implementation of the sectoral support provided for in this Protocol. 1. Should Union vessels be interested in fishing activities which are not indicated in Article 1, the Union shall consult Côte d'Ivoire in order to seek authorisation for these new activities. In the course of these consultations, the Parties shall take account of the relevant scientific opinions, in particular opinions issued by regional or subregional fisheries organisations. Where appropriate, the Parties shall agree on the conditions applicable to these new fishing opportunities and on the implementation of multiannual management plans. They shall, if necessary, make amendments to this Protocol and to the Annex thereto. 2. Following the consultations laid down in Article 5(4), the Parties may authorise exploratory fishing surveys in the Ivorian fishing zone to test the technical feasibility and the economic viability of new fisheries. the proposal for the technical parameters of the trip (length, gear, exploration regions, etc.). The exploratory fishing trips shall have a maximum duration of six months. They shall be subject to the payment of a fee set by the Ivorian authorities. A scientific observer from the flag State and an observer chosen by the Ivorian authorities shall be present on board throughout the duration of the trip. Catches consistent with and obtained during the exploratory trip shall remain the property of the vessel owner. The detailed results of the trip shall be sent to the Joint Committee for analysis. 1. The activities of Union vessels operating in Ivorian waters shall be governed by the applicable law in Côte d'Ivoire, unless otherwise provided for in the Agreement and this Protocol. 2. The Ivorian authorities shall immediately inform the Union of any change or any new legislation relating to the fishing sector. 3. The Union shall inform the Ivorian authorities of any change or any new legislation relating to the fishing activities of the Union distant-water fleet. a serious and unresolved dispute between the two Parties within the Joint Committee on the application or the interpretation of this Protocol. 2. Where the application of this Protocol is suspended for reasons other than those given in point (c) of paragraph 1, the Party concerned shall be required to notify its intention in writing at least three months before the date on which suspension is due to take effect. Suspension of this Protocol for the reasons given in point (c) of paragraph 1 shall apply immediately after the suspension decision has been taken. 3. In the event of suspension, the Parties shall continue to consult with a view to finding an amicable settlement to their dispute. Where such a settlement is reached, application of this Protocol shall resume and the amount of the financial contribution shall be reduced proportionately and pro rata temporis according to the period during which application of this Protocol was suspended. 4. The fishing authorisations granted to Union vessels may be suspended at the same time as the suspension of the payment of the financial contribution under Article 3(2)(a). If resumed, the validity of these fishing authorisations shall be extended for a period equal to the period of suspension of fishing activities. 5. Save as provided for in paragraph 1 of this Article, if the Union omits to make the payment laid down in Article 3(2)(a), the Ivorian authorities shall officially inform the Union of the non-payment. The Union shall perform the appropriate checks and, where necessary, transmit the payment within no more than 60 days of the date of receipt of the official request. If no payment has been made by that deadline without proper justification, the Ivorian authorities shall be entitled to suspend application of this Protocol in accordance with paragraphs 2, 3 and 4 of this Article. Application of this Protocol shall resume as soon as the payment concerned has been made. 1. The Union and Côte d'Ivoire shall ensure proper operation of the IT systems required for the electronic exchange of all the information and documents relating to the implementation of the Agreement and this Protocol. 2. The electronic form of a document shall be considered equivalent to the paper version in every respect. 3. The Union and Côte d'Ivoire shall inform each other of any malfunction of an IT system as soon as possible. The information and documents relating to the implementation of the Agreement and this Protocol shall then be automatically replaced by their paper version. The Union and Côte d'Ivoire shall ensure that all nominative data relating to Union vessels and their fishing activities obtained within the framework of the Agreement and this Protocol are, at all times, processed strictly in accordance with their respective principles of confidentiality and data protection. The Parties shall ensure that only aggregated data for tuna fishing activities in the Ivorian fishing zone are made public, in conformity with the corresponding provisions of the ICCAT and other regional or subregional fisheries organisations. Data considered confidential shall be used by the competent authorities exclusively for the purposes of implementing the Agreement and this Protocol. 1. In the event of termination of this Protocol, the Party concerned shall notify the other Party in writing of its intention to terminate this Protocol at least six months before the date on which such termination would take effect. 2. Dispatch of the notification, as referred to in paragraph 1, shall open consultations between the Parties. This Protocol shall apply provisionally from the date of its signature by the Parties. This Protocol shall enter into force on the date on which the Parties notify each other of the completion of the procedures necessary for this purpose. for Côte d'Ivoire: the Ministry responsible for fisheries. The Côte d'Ivoire authorities shall send the competent Union services the geographic coordinates of the Ivorian fishing zone from the base line, as soon as possible. Union vessels may carry out fishing activities in waters beyond 12 nautical miles from the base line subject to the provisions of point 3 of this Chapter. When issuing the fishing licence, Côte d'Ivoire shall inform vessel owners and the Union of the boundaries of the zones in which shipping and fishing are prohibited. Any changes to these zones shall be notified to the Union as soon as possible. Côte d'Ivoire shall send the Union the details of the Public Treasury account into which the financial sums payable by Union vessels under the Agreement should be paid, before the provisional application of this Protocol. The associated bank transfer costs shall be borne by vessel owners. For the purposes of applying the provisions of this Annex, the term ‘licence’ shall be equivalent to the term ‘fishing authorisation’, as laid down in Union legislation. Only eligible vessels may obtain a licence to fish in the Ivorian fishing zone. For this, they must be entered in the register of Union vessels and comply with the provisions of Regulation (EU) 2017/2403 of the European Parliament and of the Council (1). For a vessel to be eligible, the owner, the master and the vessel itself must not be prohibited from fishing in Côte d'Ivoire. They must be in order vis-à-vis the Ivorian authorities insofar as they must have fulfilled all prior obligations arising from their fishing activities in Côte d'Ivoire under fisheries agreements concluded with the Union. The relevant Union authorities shall submit, by electronic means or by any other expeditious method, to the Ministry responsible for fisheries in Côte d'Ivoire an application for each vessel wishing to fish under the Agreement at least 30 working days before the date of commencement of the period of validity requested. Applications shall be submitted to the Ministry responsible for fisheries on a form drawn up in accordance with the specimen in Appendix 1.
an illustration and a detailed description of the fishing gear used. For the renewal of a licence under this Protocol for a vessel whose technical specifications have not been modified, the renewal application shall be accompanied only by proof of payment of the fee. The fee shall be paid into the account specified by the Ivorian authorities in accordance with Chapter I, point 4 of this Annex. The fees shall include all national and local charges, with the exception of port taxes and service charges. Once it has received the fishing authorisation applications and notification of payment of the advance, Côte d'Ivoire shall draw up the provisional list of applicant vessels. This list shall immediately be sent electronically to the Union and the national authority responsible for supervising fishing. Vessels shall be authorised to fish as soon as they are included on the provisional list. Vessels must keep a copy of the provisional list on board at all times until their fishing authorisation is issued. Licences for all vessels shall be issued to vessel owners or their representatives, where applicable through the Delegation of the European Union to Côte d'Ivoire, within 21 working days of receipt of all the documents referred to in point 2 of this Chapter by the Ministry responsible for fisheries in Côte d'Ivoire. Licences shall be valid for a maximum of one year and are renewable. Once the licence is issued, Côte d'Ivoire shall immediately draw up the final list of vessels authorised to fish in the Ivorian fishing zone. This list shall be sent immediately to the national body responsible for monitoring fishing and to the Union and shall replace the provisional list referred to above. Licences shall be issued for a specific vessel and shall not be transferable. 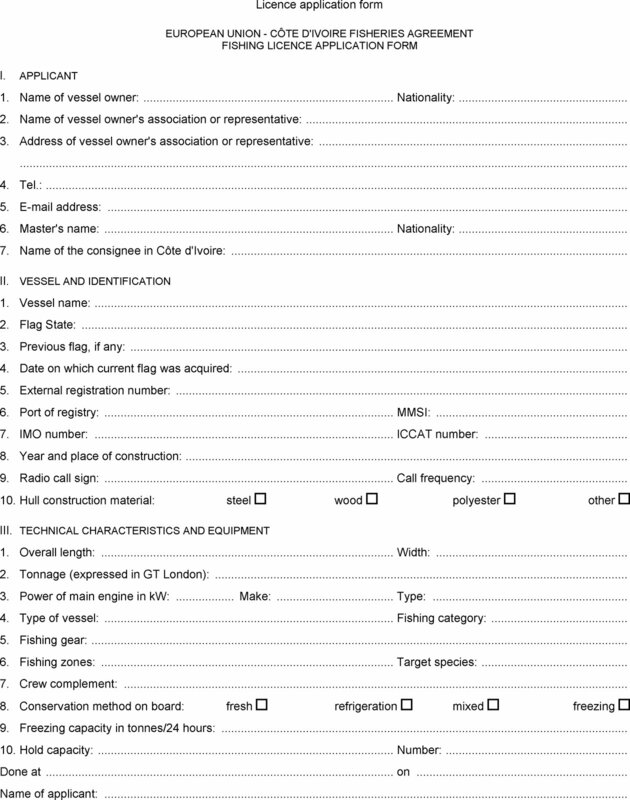 However, at the request of the Union and where force majeure is proven, such as in the event of the loss or prolonged immobilisation of a vessel due to a serious technical failure, the licence of one vessel shall be replaced by a new licence for another vessel of the same fishing category as referred to in Article 1 of this Protocol and belonging to the same vessel owner, the same association of vessel owners or the same producers' organisation, with no further fee being charged. In that case, the calculation of the catch levels to determine whether an additional payment should be made shall take account of the sum of the total catches of the two vessels. The owner of the vessel to be replaced, or his or her representative, shall return the cancelled licence to the Ministry responsible for fisheries in Côte d'Ivoire via the Delegation of the European Union to Côte d'Ivoire. The new licence shall take effect on the day that the vessel's owner returns the cancelled licence to the Ministry responsible for fisheries in Côte d'Ivoire. The Delegation of the European Union to Côte d'Ivoire shall be informed of the licence transfer. The licence must be held on board at all times. Vessels shall, however, be authorised to fish as soon as they are included on the provisional list referred to in point 4 of this Chapter. At the request of the Union, and following an examination by the Ivorian authorities, Côte d'Ivoire shall authorise Union vessels holding a fishing licence to be assisted by support vessels. The support vessels may not be equipped for fishing. This support must not include refuelling or the transhipment of catches. Support vessels are subject to the same procedure as regards the sending of applications for fishing authorisations set out in this Chapter, to the extent applicable. Côte d'Ivoire shall draw up a list of authorised support vessels and send it to the Union immediately. These vessels shall be subject to the payment of an annual fee of EUR 3 500. EUR 70 for the third, fourth, fifth and sixth years. EUR 8 890 per vessel, equivalent to fees due for 127 tonnes per year for the third, fourth, fifth and sixth years. EUR 2 800 per vessel, equivalent to fees due for 40 tonnes per year for the third, fourth, fifth and sixth years. Where a licence is for less than one year, the amount of the fee shall be in proportion to the term of the licence in accordance with Côte d'Ivoire legislation. However, for tuna seiners, the term of the licence may not be less than 12 months. 3. The Union shall draw up for each vessel a statement of catches and a statement of fees owed by the vessel in respect of its annual season for the previous calendar year. It shall forward those statements to the authorities of Côte d'Ivoire at the latest by the end of April of the current year. Côte d'Ivoire may challenge those statements, on the basis of documentary proof, within 30 days of their receipt. In the case of disagreement, the Parties shall consult each other in the Joint Committee. If Côte d'Ivoire does not object within 30 days, the statements are deemed to have been adopted. 4. Where the final statement is greater than the flat-rate fee paid to obtain the fishing authorisation, the vessel owner shall pay the outstanding balance to Côte d'Ivoire within 45 days unless the vessel owner contests the payment. However, if the amount of the final statement is lower than the advance referred to in point 2 of this Section, the resulting balance shall not be reimbursable to the vessel owner. The master of a Union vessel fishing under the Agreement shall keep a fishing logbook, in accordance with the relevant ICCAT recommendations and resolutions for seiners and longliners. The fishing logbook shall be completed by the master for each day the vessel is present in the Ivorian fishing zone. Each day the master shall record in the fishing logbook the quantity of each species, identified by its Food and Agriculture Organisation (FAO) alpha 3 code, caught and kept on board, expressed in kilograms of live weight or, where necessary, the number of individual fish. For each main species, the master shall also include the bad catch. Where applicable, the master shall also record each day in the fishing logbook the quantities of each species thrown back into the sea, expressed in kilograms of live weight or, where necessary, the number of individual fish. The fishing logbook shall be filled in legibly, in block capitals, and shall be signed by the master. The master shall be responsible for the accuracy of the data recorded in the fishing logbook. IPMA (Instituto Português do Mar e da Atmosfera). When leaving the Ivorian fishing zone before the end of the trip, without first passing through an Ivorian port, the fishing logbook shall be sent within a period of seven days after leaving the Ivorian fishing zone. If they cannot be sent by e-mail, the catch reports can be sent either by post or by fax. The email address and telephone and fax numbers to be used shall be sent by the Ivorian authorities prior to the provisional application of this Protocol. Côte d'Ivoire shall immediately inform the vessels concerned and the Union of any change to those contact details. If the provisions set out in this Chapter are not complied with, the Government of Côte d'Ivoire reserves the right to suspend the licence of the offending vessel until formalities have been completed and to apply the penalty laid down in current Ivorian legislation to the vessel owner. The Union and the flag Member State shall be informed thereof. The two Parties indicate their shared willingness to ensure, during the first year of application of this Protocol, a transition to an electronic system of communication and transmission of data relating to fishing activities, including the daily transmission of catch data reports. The Parties agree to determine together the terms of this transition within the Joint Committee in order to make the system operational as soon as possible. The technical measures applicable to the vessels holding a fishing licence, relating to the fishing zone, authorised gear and prohibited species, shall be defined in the technical sheet contained in Appendix 2 to this Annex. Vessels shall comply with the measures and recommendations adopted by the ICCAT in the region regarding fishing gear and fish aggregating devices, the technical specifications thereof and all other technical measures applicable to their fishing activities. At least three hours in advance, Union vessels shall notify the competent Ivorian authorities responsible for fisheries control of their intention to enter or leave the Ivorian fishing zone. the nature and presentation of the product. The information referred to in subpoint 1.1 should preferably be communicated by e-mail or, failing that, by fax. The Côte d'Ivoire shall immediately confirm receipt thereof. Vessels found to be fishing without having informed the competent Côte d'Ivoire authority shall be regarded as vessels in breach of the rules. Masters of Union vessels engaged in fishing activities in Ivorian waters shall allow any Ivorian official responsible for the inspection and control of fishing activities to discharge their duties. These officials shall not remain on board for longer than is necessary for the discharge of their duties. At the end of each inspection, the Ivorian inspectors shall draw up an inspection report. The master of the Union vessel shall have the right to include their comments in the inspection report. The inspection report shall be signed by the inspector drawing up the report and by the master of the Union vessel. The signing of the inspection report by the master shall be without prejudice to the vessel owner's right of defence in respect of any infringement found. If the master refuses to sign this document, he or she shall specify the reasons for doing so in writing and the inspector shall write ‘Refused to sign’ on it. The Ivorian inspectors shall issue a copy of the inspection report to the master of the Union vessel before leaving. Côte d'Ivoire may authorise the Union to take part in inspections as an observer. In order to strengthen monitoring of fishing on the high seas and the fight against IUU fishing, Union vessels shall report the presence of any vessels in the Ivorian fishing zone that are suspected of conducting illegal fishing activities. All Union vessels wishing to land or transship catches in Ivorian waters shall do so only in or off Ivorian ports. the day and place of the transaction. In the case of transshipment, the masters must send the catch reports to the competent Ivorian authorities. Masters of Union vessels engaged in landing or transshipment operations in Côte d'Ivoire shall allow and facilitate the inspection of such operations by duly mandated inspectors, who are recognisable as such. Once the inspection has been completed, a copy of the report shall be issued to the master. Whilst they are in the Ivorian fishing zone, Union vessels holding a licence must be equipped with a satellite-based vessel monitoring system (VMS) to enable automatic and continuous communication of their position, at all times, to the Fisheries Monitoring Centre (FMC) of their flag State. The position messages shall comply with the specifications relating to the geographical position of vessels included in the ICCAT recommendations. Those messages must be configured according to the format specified by the applicable ICCAT standards. The FMC of the flag State shall ensure the automatic processing and, if necessary, the electronic transmission of the position messages. The position messages shall be recorded in a secure manner and kept for a period of three years. The master shall ensure at all times that the VMS of his/her vessel is fully operational and that the position messages are correctly transmitted to the FMC of the flag State. In the event of breakdown, the VMS of the vessel shall be repaired or replaced within one month. After that period, the vessel shall no longer be authorised to fish in the Ivorian fishing zone. Vessels fishing in the Ivorian fishing zone with a defective VMS system shall communicate their position messages by e-mail, radio or fax to the FMC of the flag State, at least every four hours, and shall provide all the compulsory information set out in point 1. The FMC of the flag State shall automatically send the position messages of the vessels concerned to the Ivorian FMC using a secure electronic communication system. The FMC of the flag State and the Ivorian FMC shall exchange their contact e-mail addresses and inform each other immediately of any change to those addresses. The FMC of the Côte d'Ivoire shall inform the FMC of the flag State and the Union of any interruption in the receiving of consecutive position messages from a vessel holding a licence, where the vessel concerned has not notified its departure from the Ivorian fishing zone. Côte d'Ivoire shall ensure the compatibility of its electronic equipment with that of the FMC of the flag State and inform the Union immediately of any malfunction as regards the communication and receiving of position messages with a view to finding a technical solution as soon as possible. The Joint Committee shall deal with any disputes that may arise. The master shall be considered responsible if a vessel's VMS is found to have been tampered with in order to disturb its operation or falsify its position messages. Any infringements shall be subject to the penalties provided for under Ivorian legislation. On the basis of documentary evidence proving an infringement, Côte d'Ivoire may ask the FMC of the flag State, copying in the Union, to reduce the frequency with which position messages are sent from a vessel to once every thirty minutes for a set period of investigation. This documentary evidence must be sent without delay by Côte d'Ivoire to the FMC of the flag State and the Union. The FMC of the flag State shall immediately send the position messages to Côte d'Ivoire at the new frequency. When the period of investigation ends, Côte d'Ivoire shall immediately inform the FMC of the flag State and the Union and subsequently inform them of any follow-up. for the fleet of surface longliners, at least 20 % of the seamen signed on during the fishing season in the fishing zone of the third country shall be of ACP origin. 2. Vessel owners shall endeavour to take on board Ivorian seamen first. 3. The International Labour Organisation (ILO) Declaration on Fundamental Principles and Rights at Work shall apply as of right to seamen signed on by Union vessels. This concerns in particular the freedom of association and the effective recognition of the right to collective bargaining, and the elimination of discrimination in respect of employment and occupation. 4. The employment contracts of ACP seamen shall be drawn up between the vessel owners' representative(s) and the seamen and/or their trade unions or representatives; a copy of those contracts shall be given to the signatories. The contracts shall guarantee the seamen the social security cover applicable to them, including life assurance and sickness and accident insurance. 5. The wages of the ACP seamen shall be paid by the vessel owners. They shall be set by mutual agreement between the vessel owners or their representatives and the seamen and/or their trade unions or representatives. However, the wages of ACP seamen may not be lower than those payable to crews from their respective countries and may under no circumstances be below ILO standards. 6. All seamen employed on board Union vessels shall report to the master of the vessel designated on the day before their proposed embarkation date. If a seaman fails to report at the agreed time of embarkation, vessel owners shall be automatically relieved of their obligation to take the seaman on board. 7. If the vessel does not arrive at the agreed time at a previously agreed port to take on an Ivorian seaman, the vessel owner shall reimburse the costs incurred by the seaman while waiting at the port (accommodation, food, etc.) at a flat rate of EUR 80 per day. 8. Where an Ivorian seaman is not disembarked at a Côte d'Ivoire port, the vessel owner shall bear the costs of repatriating the seaman to Côte d'Ivoire as soon as possible. of a non-ACP and non-Union country. 10. The Côte d'Ivoire seamen to be taken on board are freely chosen by the vessel owner from a register kept by the Côte d'Ivoire Seafarers Directorate. The master shall, however, send a list of Côte d'Ivoire seamen already on board a Union vessel to the Seafarers Directorate along with a copy of their identity documents. Pending the implementation of a system of regional observers, vessels authorised to fish in the Ivorian fishing zone under the Agreement shall take on board, instead of regional observers, observers designated by Côte d'Ivoire in accordance with the rules set out in this Chapter, to accomplish the tasks set out under point 4 of this Chapter. Côte d'Ivoire shall draw up a list of vessels designated to take an observer on board and a list of the appointed observers. Those lists shall be kept up to date. They shall be forwarded to the Union as soon as they have been drawn up and every quarter thereafter where they have been updated. Côte d'Ivoire shall inform the vessel owners concerned, or their representatives, of the name of the observer appointed to be taken on board their vessel at the time the licence is issued, or no later than 15 days before the observer's planned embarkation date. The time spent on board by the observer shall be one fishing trip. However, at the express request of Côte d'Ivoire, this embarkation may be spread over several trips according to the average trip duration for a particular vessel. This request shall be made by Côte d'Ivoire when the name of the observer appointed to board the vessel in question is notified. The conditions under which the observer is taken on board shall be agreed between the vessel owner or his/her representative and Côte d'Ivoire. The observer shall be taken on board at a port chosen by the vessel owner at the beginning of the first voyage in the Ivorian fishing zone after notification of the list of designated vessels. Within two weeks and giving ten days' notice, the vessel owners concerned shall make known at which ports and on what dates they intend to take observers on board. If an observer is taken on board in a country other than Côte d'Ivoire, his or her travel costs shall be borne by the vessel owner. If the observer is not present at the time and place agreed and during the 12 hours following the time agreed, the vessel owner shall be automatically relieved of their obligation to take the observer on board. The master shall do everything in his/her power to ensure the physical safety and welfare of the observer during the performance of his/her duties. The observer shall be offered every facility needed to carry out their duties. The master shall give him/her access to the means of communication needed for the discharge of his/her duties, to documents directly concerned with the vessel's fishing activities, including in particular the logbook and the navigation log, and to those parts of the vessel necessary to facilitate the exercise of his/her tasks. The vessel owner shall bear the cost of providing board and accommodation for observers in the same conditions as for officers, within the confines of the practical possibilities offered by the vessel. The salary and social contributions of each observer shall be borne by Côte d'Ivoire. report fishing data, including the quantity of catches and by-catches on board, to their competent authority by any appropriate means. at the end of the observation period and before leaving the vessel, the observer shall draw up an activity report to be transmitted to the competent authorities, with a copy sent to the Union. He/she shall sign it in the presence of the master, who may add or have added to it any observations considered relevant, followed by the master's signature. A copy of the report shall be handed to the master when the scientific observer is put ashore. At the time of payment of the annual advance to obtain the licence, the vessel owner shall pay an annual flat-rate financial contribution of EUR 400 per vessel to Côte d'Ivoire, to contribute to the costs of embarking Ivorian observers on Union vessels. Any infringement committed by a Union vessel holding a licence in accordance with the provisions of this Annex must be communicated by the Ivorian authorities to the Union within 24 hours. The statement relating to this infringement shall be sent to the Union and the flag State within seven working days. Any Union vessel suspected of having committed an infringement may be forced to cease its fishing activity and, if necessary, where the vessel is at sea, to return to an Ivorian port. Côte d'Ivoire shall notify the Union within a maximum of 24 hours of any diversion of a Union vessel holding a licence. That notification shall be accompanied by documentary evidence of the infringement. Before taking any measures against the vessel, the master, the crew or the cargo, with the exception of measures taken to protect evidence, Côte d'Ivoire shall organise, at the request of the Union, within one working day of notification of the diversion of the vessel, an information meeting to clarify the facts which have led to the vessel being diverted and to explain what further action may be taken. A representative of the vessel's flag State may attend this information meeting. The penalty for the infringement found shall be set by Côte d'Ivoire according to the provisions of Ivorian legislation. Where settling the infringement involves legal proceedings, before these are launched, and provided that the infringement does not involve a criminal act, a compromise procedure may be undertaken between Côte d'Ivoire and the vessel owner or his/her representative in order to determine the terms and level of the penalty. A representative of the flag State of the vessel and of the Union may participate in that compromise procedure. The compromise procedure shall finish at the latest three days after notification of the vessel's diversion. If the compromise procedure fails and the infringement is brought before the competent court, the owner of the vessel which committed the infringement shall deposit a bank security at a bank designated by Côte d'Ivoire, the amount of which, set by Côte d'Ivoire, covers the costs associated with the diversion and immobilisation of the vessel, the estimated fine and any compensation. The bank security may not be recovered until the legal proceedings have been concluded. for the amount of the remaining balance, if the penalty is a fine which is lower than the amount of the bank security. Côte d'Ivoire shall inform the Union of the outcome of the legal proceedings within seven working days of the judgment being given. once the bank security has been lodged. (1) Regulation (EU) 2017/2403 of the European Parliament and of the Council of 12 December 2017 on the sustainable management of external fishing fleets, and repealing Council Regulation (EC) No 1006/2008 (OJ L 347, 28.12.2017, p. 81). In accordance with the Convention on Migratory Species and with the ICCAT resolutions, fishing for basking shark (Cetorhinus maximus), great white shark (Carcharodon carcharias), bigeye thresher shark (Alopias superciliosus), hammerhead sharks in the Sphyrnidae family (with the exception of the bonnethead shark), oceanic whitetip shark (Carcharhinus longimanus), silky shark (Carcharhinus falciformis), sand tiger shark (Carcharias taurus) and tope shark (Galeorhinus galeus) is prohibited. The two Parties shall consult within the Joint Committee to update this list on the basis of scientific recommendations. EUR 60 per tonne for the first two years of application of the Protocol and EUR 70 per tonne for the following years. For tuna seiners, EUR 7 620 for the first two years of application of the Protocol and EUR 8 890 for the following years. For surface longliners, EUR 2 400 for the first two years of application of the Protocol and EUR 2 800 for the following years. Council Regulation (EU) 2017/1970 (1) establishes, among others, the fishing opportunities for herring in ICES Subdivisions 30-31 (‘the Gulf of Bothnia herring stock’) in accordance with Regulation (EU) 2016/1139 of the European Parliament and of the Council (2). Regulation (EU) 2016/1139 has been amended by Regulation (EU) 2018/976 of the European Parliament and of the Council (3) as regards the Gulf of Bothnia herring stock, taking into account the latest scientific information provided by ICES. Following that amendment to Regulation (EU) 2016/1139, the fishing opportunities for the Gulf of Bothnia herring stock should be increased. Regulation (EU) 2017/1970 should therefore be amended accordingly. (1) Council Regulation (EU) 2017/1970 of 27 October 2017 fixing for 2018 the fishing opportunities for certain fish stocks and groups of fish stocks applicable in the Baltic Sea and amending Regulation (EU) 2017/127 (OJ L 281, 31.10.2017, p. 1). (2) Regulation (EU) 2016/1139 of the European Parliament and of the Council of 6 July 2016 establishing a multiannual plan for the stocks of cod, herring and sprat in the Baltic Sea and the fisheries exploiting those stocks, amending Council Regulation (EC) No 2187/2005 and repealing Council Regulation (EC) No 1098/2007 (OJ L 191, 15.7.2016, p. 1). (3) Regulation (EU) 2018/976 of the European Parliament and of the Council of 4 July 2018 amending Regulation (EU) 2016/1139 as regards fishing mortality ranges and safeguard levels for certain herring stocks in the Baltic Sea (OJ L 179, 16.7.2018, p. 76). On 21 March 2018, the Council adopted Implementing Regulation (EU) 2018/468 (2) implementing Article 2(3) of Regulation (EC) No 2580/2001, establishing an updated list of persons, groups and entities to which Regulation (EC) No 2580/2001 applies (‘the list’). The Council has provided all the persons, groups and entities with statements of reasons explaining why they were entered into the list, where practically possible. By way of a notice published in the Official Journal of the European Union, the Council informed the persons, groups and entities on the list that it had decided to keep them thereon. The Council also informed the persons, groups and entities concerned that it was possible to request a statement of the Council's reasons for entering them onto the list where such a statement had not already been communicated to them. The Council has reviewed the list as required by Article 2(3) of Regulation (EC) No 2580/2001. When carrying out that review, the Council took into account the observations submitted to it by those concerned as well as the updated information received from the competent national authorities on the status of listed individuals and entities at the national level. The Council has verified that competent authorities as referred to in Article 1(4) of Common Position 2001/931/CFSP (3) have taken decisions with regards to all persons, groups and entities to the effect that they have been involved in terrorist acts within the meaning of Article 1(2) and (3) of Common Position 2001/931/CFSP. The Council has also concluded that the the persons, groups and entities to which Articles 2, 3 and 4 of Common Position 2001/931/CFSP apply should continue to be subject to the specific restrictive measures provided for in Regulation (EC) No 2580/2001. The list provided for in Article 2(3) of Regulation (EC) No 2580/2001 is set out in the Annex to this Regulation. Implementing Regulation (EU) 2018/468 is hereby repealed. Done at Brussels, 30 July 2018. (1) OJ L 344, 28.12.2001, p. 70. (2) Council Implementing Regulation (EU) 2018/468 of 21 March 2018 implementing Article 2(3) of Regulation (EC) No 2580/2001 on specific restrictive measures directed against certain persons and entities with a view to combating terrorism and repealing Implementing Regulation (EU) 2017/1420 (OJ L 79, 22.3.2018, p. 7). (3) Council Common Position 2001/931/CFSP of 27 December 2001 on the application of specific measures to combat terrorism (OJ L 344, 28.12.2001, p. 93). ABDOLLAHI Hamed (a.k.a. Mustafa Abdullahi), born 11.8.1960 in Iran. Passport number: D9004878. AL-NASSER, Abdelkarim Hussein Mohamed, born in Al Ihsa (Saudi Arabia), citizen of Saudi Arabia. AL YACOUB, Ibrahim Salih Mohammed, born 16.10.1966 in Tarut (Saudi Arabia), citizen of Saudi Arabia. ARBABSIAR Manssor (a.k.a. Mansour Arbabsiar), born 6.3.1955 or 15.3.1955 in Iran. Iranian and US national. Passport number: C2002515 (Iran); Passport number: 477845448 (USA). National ID no. : 07442833, expiry date 15.3.2016 (USA driving licence). BOUYERI, Mohammed (a.k.a. Abu ZUBAIR, a.k.a. SOBIAR, a.k.a. Abu ZOUBAIR), born 8.3.1978 in Amsterdam (The Netherlands). EL HAJJ, Hassan Hassan, born 22.3.1988 in Zaghdraiya, Sidon, Lebanon, Canadian citizen. Passport number: JX446643 (Canada). IZZ-AL-DIN, Hasan (a.k.a. GARBAYA, Ahmed, a.k.a. SA-ID, a.k.a. SALWWAN, Samir), Lebanon, born in 1963 in Lebanon, citizen of Lebanon. MELIAD, Farah, born 5.11.1980 in Sydney (Australia), Australian citizen. Passport number: M2719127 (Australia). MOHAMMED, Khalid Shaikh (a.k.a. ALI, Salem, a.k.a. BIN KHALID, Fahd Bin Adballah, a.k.a. HENIN, Ashraf Refaat Nabith, a.k.a. WADOOD, Khalid Adbul), born 14.4.1965 or 1.3.1964 in Pakistan, passport number: 488555. ȘANLI, Dalokay (a.k.a. Sinan), born 13.10.1976 in Pülümür (Turkey). SHAHLAI Abdul Reza (a.k.a. Abdol Reza Shala'i, a.k.a. Abd-al Reza Shalai, a.k.a. Abdorreza Shahlai, a.k.a. Abdolreza Shahla'i, a.k.a. Abdul-Reza Shahlaee, a.k.a. Hajj Yusef, a.k.a. Haji Yusif, a.k.a. Hajji Yasir, a.k.a. Hajji Yusif, a.k.a. Yusuf Abu-al-Karkh), born circa 1957 in Iran. Addresses: (1) Kermanshah, Iran, (2) Mehran Military Base, Ilam Province, Iran. SHAKURI Ali Gholam, born circa 1965 in Tehran, Iran. SOLEIMANI Qasem (a.k.a. Ghasem Soleymani, a.k.a. Qasmi Sulayman, a.k.a. Qasem Soleymani, a.k.a. Qasem Solaimani, a.k.a. Qasem Salimani, a.k.a. Qasem Solemani, a.k.a. Qasem Sulaimani, a.k.a. Qasem Sulemani), born 11.3.1957 in Iran. Iranian national. Passport number: 008827 (Iran Diplomatic), issued 1999. Title: Major General. ‘Abu Nidal Organisation’ — ‘ANO’ (a.k.a. ‘Fatah Revolutionary Council’, a.k.a. ‘Arab Revolutionary Brigades’, a.k.a. ‘Black September’, a.k.a. ‘Revolutionary Organisation of Socialist Muslims’). ‘Communist Party of the Philippines’, including ‘New People's Army’ — ‘NPA’, Philippines. ‘Gama'a al-Islamiyya’ (a.k.a. ‘Al-Gama'a al-Islamiyya’) (‘Islamic Group’ — ‘IG’). ‘İslami Büyük Doğu Akıncılar Cephesi’ — ‘IBDA-C’ (‘Great Islamic Eastern Warriors Front’). ‘Hamas’, including ‘Hamas-Izz al-Din al-Qassem’. ‘Hizballah Military Wing’ (a.k.a. ‘Hezbollah Military Wing’, a.k.a. ‘Hizbullah Military Wing’, a.k.a. ‘Hizbollah Military Wing’, a.k.a. ‘Hezballah Military Wing’, a.k.a. ‘Hisbollah Military Wing’, a.k.a. ‘Hizbu'llah Military Wing’, a.k.a. ‘Hizb Allah Military Wing’, a.k.a. ‘Jihad Council’ (and all units reporting to it, including the External Security Organisation)). ‘Khalistan Zindabad Force’ — ‘KZF’. ‘Kurdistan Workers' Party’ — ‘PKK’, (a.k.a. ‘KADEK’, a.k.a. ‘KONGRA-GEL’). ‘Liberation Tigers of Tamil Eelam’ — ‘LTTE’. ‘Ejército de Liberación Nacional’ (‘National Liberation Army’). ‘Palestinian Islamic Jihad’ — ‘PIJ’. ‘Popular Front for the Liberation of Palestine’ — ‘PFLP’. ‘Popular Front for the Liberation of Palestine — General Command’ (a.k.a. ‘PFLP — General Command’). ‘Devrimci Halk Kurtuluș Partisi-Cephesi’ — ‘DHKP/C’ (a.k.a. ‘Devrimci Sol’ (‘Revolutionary Left’), a.k.a. ‘Dev Sol’) (‘Revolutionary People's Liberation Army/Front/Party’). ‘Sendero Luminoso’ — ‘SL’ (‘Shining Path’). ‘Teyrbazen Azadiya Kurdistan’ — ‘TAK’ (a.k.a. ‘Kurdistan Freedom Falcons’, a.k.a. ‘Kurdistan Freedom Hawks’). On 17 March 2014, the Council adopted Regulation (EU) No 269/2014. As part of the Union's non-recognition policy of the illegal annexation of Crimea and Sevastopol, the Council regards the construction of the Kerch Bridge as a further action undermining the territorial integrity, sovereignty and independence of Ukraine. The construction of this bridge and its official opening, on 15 May 2018, are key symbolic steps in consolidating the Russian Federation's control over the illegally annexed Crimea and Sevastopol and further isolating the peninsula from Ukraine. In view of the above, additional entities should be added to the list of persons, entities and bodies subject to restrictive measures as set out in Annex I to Regulation (EU) No 269/2014. The entities listed in the Annex to this Regulation shall be added to the list of entities set out in Annex I to Regulation (EU) No 269/2014. (1) OJ L 78, 17.3.2014, p. 6. AO “Institute Giprostroymost — Saint-Petersburg” participated in the construction of the Kerch Bridge through its design of the Bridge, connecting Russia to the illegally annexed Crimean peninsula. Therefore it is supporting the consolidation of the illegally annexed Crimean peninsula into the Russian Federation, which in turn further undermines the territorial integrity, sovereignty and independence of Ukraine. PJSC Mostotrest actively participated in the construction of the Kerch Bridge through its state contract for the maintenance of the bridge, connecting Russia to the illegally annexed Crimean peninsula. Furthermore it is owned by an individual (Arkady Rotenberg) that is already designated for his actions undermining Ukrainian sovereignty (person No 92 in this Annex). Therefore the company is supporting the consolidation of the illegally annexed Crimean peninsula into the Russian Federation, which in turn further undermines the territorial integrity, sovereignty and independence of Ukraine. JSC Zaliv Shipyard actively participated in the construction of new railway to the Kerch Bridge, connecting Russia to the illegally annexed Crimean peninsula. Therefore it is supporting the consolidation of the illegally annexed Crimean peninsula into the Russian Federation, which in turn further undermines the territorial integrity, sovereignty and independence of Ukraine. Stroygazmontazh Corporation (SGM Group) actively participated in the construction of the Kerch Bridge through its state contract for the construction of the bridge connecting Russia to the illegally annexed Crimean peninsula. Furthermore it is owned by an individual (Arkady Rotenberg) that is already designated for his actions undermining Ukrainian sovereignty (person No 92 in this Annex). Therefore the company is supporting the consolidation of the illegally annexed Crimean peninsula into the Russian Federation, which in turn further undermines the territorial integrity, sovereignty and independence of Ukraine. Stroygazmontazh Most OOO is a subsidiary of lead contractor Stroygazmontazh that manages the construction project of the bridge over the Kerch Strait. Furthermore it is owned by an individual (Arkady Rotenberg) that is already designated for his actions undermining Ukrainian sovereignty (person No 92 in this Annex). Therefore the company is supporting the consolidation of the illegally annexed Crimean peninsula into the Russian Federation, which in turn further undermines the territorial integrity, sovereignty and independence of Ukraine. CJSC VAD is the main contractor for the construction of the Tavrida Highway in Crimea, the road over the Kerch Bridge and the access roads to it. Tavrida Highway will provide transportation access to Crimea through a system of newly constructed roadways that serve as a primary connection to the Kerch Bridge. Therefore CJSC VAD is supporting the consolidation of the illegally annexed Crimean peninsula into the Russian Federation, which in turn further undermines the territorial integrity, sovereignty and independence of Ukraine. On 18 January 2016, the Council adopted Regulation (EU) 2016/44. In accordance with Article 21(6) of Regulation (EU) 2016/44, the Council has reviewed the list of designated persons and entities set out in Annex III to that Regulation. The Council concluded that one person should no longer be kept on the list of persons and entities set out in Annex III to Regulation (EU) 2016/44. Annex III to Regulation (EU) 2016/44 shall be amended as set out in the Annex to this Regulation. (1) OJ L 12, 19.1.2016, p. 1. In Regulation (EU) 2016/44, Annex III (‘List of natural and legal persons, entities or bodies referred to in Article 6(2)’), Part A (Persons) entry No 3 (concerning ASHKAL, Omar) is deleted and the remaining entries are renumbered accordingly. On 30 August 2017, the Council adopted Regulation (EU) 2017/1509. In accordance with Article 47a(1) of Regulation (EU) 2017/1509, the Council has reviewed the list of designated persons and entities set out in Annexes XV, XVI, XVII and XVIII to that Regulation. The Council concluded that certain entries concerning the persons and entities included in Annexes XV and XVI to Regulation (EU) 2017/1509 should be updated. Annexes XV and XVI to Regulation (EU) 2017/1509 are amended as set out in the Annex to this Regulation. (1) OJ L 224, 31.8.2017, p. 1. Korean People's Army Marshal since April 2016. Former Deputy Director of the General Political Department of the Korean People's Army (military adviser to late Kim Jong-Il). Elected Workers' Party of Korea Central Committee member in May 2016 at 7th Congress of Workers' Party of Korea where WPK adopted a decision to continue the DPRK's nuclear programme. Former Deputy Director of the General Political Department of the People's Armed Forces and former Deputy Director of the Logistics Bureau of the People's Armed Forces (military adviser to late Kim Jong-Il). Present at KIM Jong Un's inspection of Strategic Rocket Force Command. Member of the Central Committee of the Workers' Party of Korea. Former Director of the General Political Department of the Korean's People's Army. Vice Marshal in the Korean People's Army, rector of the Military University of Kim Il-Sung, former member of the Central Military Commission of the Workers' Party of Korea, which is a key body for national defence matters in the DPRK. As such, responsible for supporting or promoting the DPRK's nuclear-related, ballistic-missile-related or other weapons of mass destruction-related programmes. General. First Deputy Director of the General Political Department of the Korean People's Army. Former Director of the State Security Department. Former Minister of State Security. Member of the Central Military Commission of the Workers' Party of Korea and National Defence Commission which was a key body for national defence matters in the DPRK before it was reformed into the State Affaires Commission (SAC), which are the key bodies for national defence matters in the DPRK. As such, responsible for supporting or promoting the DPRK's nuclear-related, ballistic-missile-related or other weapons of mass destruction-related programmes. In Annex XV to Regulation (EU) 2017/1509, under the heading ‘(b) Legal persons, entities and bodies designated in accordance with point (a) of Article 34(4)’, the existing entries are renumbered 1-5. DJANG Tcheul Hy has been involved together with her husband KIM Yong Nam, her son KIM Su Gwang and her daughter-in-law KIM Kyong Hui in a pattern of deceptive financial practices which could contribute to the DPRK's nuclear-related, ballistic-missile-related or other weapons of mass destruction-related programmes. She was the owner of several bank accounts in the Union which were opened by her son KIM Su Gwang in her name. She was also involved in several bank transfers from accounts from her daughter-in-law KIM Kyong Hui to bank accounts outside the Union. the entries are renumbered 1-6. Representative in Angola of Green Pine Associated Corporation and DPRK diplomat accredited to Angola. Commission Directive 2005/2/EC (2) included Ampelomyces quisqualis strain AQ10 as an active substance in Annex I to Council Directive 91/414/EEC (3). Active substances included in Annex I to Directive 91/414/EEC are deemed to have been approved under Regulation (EC) No 1107/2009 and are listed in Part A of the Annex to Commission Implementing Regulation (EU) No 540/2011 (4). The approval of the active substance Ampelomyces quisqualis strain AQ10, as set out in Part A of the Annex to Implementing Regulation (EU) No 540/2011, expires on 31 July 2018. An application for the renewal of the approval of Ampelomyces quisqualis strain AQ10 was submitted in accordance with Article 1 of Commission Implementing Regulation (EU) No 844/2012 (5) within the time period provided for in that Article. The applicant submitted the supplementary dossiers required in accordance with Article 6 of Implementing Regulation (EU) No 844/2012. The application was found to be complete by the rapporteur Member State. The rapporteur Member State prepared a renewal assessment report in consultation with the co-rapporteur Member State and submitted it to the European Food Safety Authority (‘the Authority’) and the Commission on the 25 November 2016. The Authority communicated the renewal assessment report to the applicant and to the Member States for comments and forwarded the comments received to the Commission. The Authority also made the supplementary summary dossier available to the public. On the 20 November 2017 the Authority communicated to the Commission its conclusion (6) on whether Ampelomyces quisqualis strain AQ10 can be expected to meet the approval criteria provided for in Article 4 of Regulation (EC) No 1107/2009. The Commission presented the draft renewal report for Ampelomyces quisqualis strain AQ10 to the Standing Committee on Plants, Animals, Food and Feed on 23 March 2018. The applicant was given the possibility to submit comments on the renewal report. It has been established with respect to one or more representative uses of at least one plant protection product containing Ampelomyces quisqualis strain AQ10 that the approval criteria provided for in Article 4 of Regulation (EC) No 1107/2009 are satisfied. The risk assessment for the renewal of the approval of Ampelomyces quisqualis strain AQ10 is based on a limited number of representative uses, which however do not restrict the uses for which plant protection products containing Ampelomyces quisqualis strain AQ10 may be authorised. It is therefore appropriate not to maintain the restriction for use only as a fungicide. The Commission further considers that Ampelomyces quisqualis strain AQ10 is a low-risk active substance pursuant to Article 22 of Regulation (EC) No 1107/2009. Ampelomyces quisqualis strain AQ10 fulfils the conditions set in point 5 of Annex II to Regulation (EC) No 1107/2009. Ampelomyces quisqualis strain AQ10 is a strain of a micro-organism which, taking into account the intended uses, is expected to pose a low risk to humans, animals and the environment. Furthermore, Ampelomyces quisqualis strain AQ10 is a strain of a micro-organism (fungus) which is not pathogenic to humans, nor related to any known human, animal or plant pathogen, and for which no multiple resistance to antimicrobials used in human or veterinary medicine is known. It is therefore appropriate to renew the approval of Ampelomyces quisqualis strain AQ10 as a low-risk substance. In accordance with Article 14(1) of Regulation (EC) No 1107/2009 in conjunction with Article 6 thereof and in the light of current scientific and technical knowledge, it is, however, necessary to include certain conditions. In accordance with Article 20(3) of Regulation (EC) No 1107/2009, in conjunction with Article 13(4) thereof, the Annex to Implementing Regulation (EU) No 540/2011 should be amended accordingly. Commission Implementing Regulation (EU) No 841/2017 (7) extended the expiry date of the approval of Ampelomyces quisqualis strain AQ10 to 31 July 2018 in order to allow the renewal process to be completed before the expiry of the approval of that substance. Taking into account that the approval of the active substance expires on 31 July 2018, this Regulation should apply from 1 August 2018. The approval of the active substance Ampelomyces quisqualis strain AQ10, as set out in Annex I, is renewed subject to the conditions laid down in that Annex. The Annex to Implementing Regulation (EU) No 540/2011 is amended in accordance with Annex II to this Regulation. It shall apply from 1 August 2018. (1) OJ L 309, 24.11.2009, p. 1. (2) Commission Directive 2005/2/EC of 19 January 2005 amending Council Directive 91/414/EEC to include Ampelomyces quisqualis and Gliocladium catenulatum as active substances. (OJ L 20, 22.1.2005, p. 15). (3) Council Directive 91/414/EEC of 15 July 1991 concerning the placing of plant protection products on the market (OJ L 230, 19.8.1991, p. 1). (4) Commission Implementing Regulation (EU) No 540/2011 of 25 May 2011 implementing Regulation (EC) No 1107/2009 of the European Parliament and of the Council as regards the list of approved active substances (OJ L 153, 11.6.2011, p. 1). (5) Commission Implementing Regulation (EU) No 844/2012 of 18 September 2012 setting out the provisions necessary for the implementation of the renewal procedure for active substances, as provided for in Regulation (EC) No 1107/2009 of the European Parliament and of the Council concerning the placing of plant protection products on the market (OJ L 252, 19.9.2012, p. 26). (6) EFSA Journal 2017;15(11):5078, 24 pp. doi:10.2903/j.efsa.2017.5078 Available online: www.efsa.europa.eu. (7) Commission Implementing Regulation (EU) 2017/841 of 17 May 2017 amending Implementing Regulation (EU) No 540/2011 as regards the extension of the approval periods of the active substances alpha-cypermethrin, Ampelomyces quisqualis strain: aq 10, benalaxyl, bentazone, bifenazate, bromoxynil, carfentrazone ethyl, chlorpropham, cyazofamid, desmedipham, diquat, DPX KE 459 (flupyrsulfuron-methyl), etoxazole, famoxadone, fenamidone, flumioxazine, foramsulfuron, Gliocladium catenulatum strain: j1446, imazamox, imazosulfuron, isoxaflutole, laminarin, metalaxyl-m, methoxyfenozide, milbemectin, oxasulfuron, pendimethalin, phenmedipham, pymetrozine, s-metolachlor, and trifloxystrobin (OJ L 125, 18.5.2017, p. 12). For the implementation of the uniform principles, as referred to in Article 29(6) of Regulation (EC) No 1107/2009, the conclusions of the renewal report on Ampelomyces quisqualis strain AQ10, and in particular Appendices I and II thereof, shall be taken into account. (1) Further details on identity and specification of active substance are provided in the review report. Article 17 of Regulation (EC) No 470/2009 requires that the maximum residue limit (‘MRL’) for pharmacologically active substances intended for use in the Union in veterinary medicinal products for food-producing animals or in biocidal products used in animal husbandry is established in a Regulation. Table 1 of the Annex to Commission Regulation (EU) No 37/2010 (2) sets out the pharmacologically active substances and their classification regarding MRLs in foodstuffs of animal origin. Isoflurane is already included in that table as an allowed substance for equidae, for anaesthetic use only. The existing entry has a ‘no MRL required’ classification. An application for the extension of the existing entry for isoflurane to porcine species has been submitted to the European Medicines Agency (‘EMA’). EMA, based on the opinion of the Committee for Medicinal Products for Veterinary Use, has recommended the establishment of an MRL for isoflurane in porcine species. According to Article 5 of Regulation (EC) No 470/2009, EMA is to consider using MRLs established for a pharmacologically active substance in a particular foodstuff for another foodstuff derived from the same species, or MRLs established for a pharmacologically active substance in one or more species for other species. EMA has considered that the extrapolation of the entry for isoflurane to other age groups and species cannot be reliably assessed at this time due to insufficient data. Regulation (EU) No 37/2010 should therefore be amended accordingly. It is appropriate to grant the stakeholders concerned a reasonable period of time to take measures that may be required to comply with the new MRL. The Annex to Regulation (EU) No 37/2010 is amended as set out in the Annex to this Regulation. It shall apply from 29 September 2018. (1) OJ L 152, 16.6.2009, p. 11. (2) Commission Regulation (EU) No 37/2010 of 22 December 2009 on pharmacologically active substances and their classification regarding maximum residue limits in foodstuffs of animal origin (OJ L 15, 20.1.2010, p. 1). Commission Implementing Regulation (EU) No 808/2014 (2) has laid down rules for the application of Regulation (EU) No 1305/2013. Regulation (EU) 2017/2393 of the European Parliament and of the Council (3) has amended Regulation (EU) No 1305/2013 by simplifying the general rules governing the European Agricultural Fund for Rural Development (EAFRD). Therefore, the rules for the implementation of Regulation (EU) No 1305/2013 should be amended accordingly. The obligation to select bodies to provide advice through a specific call for tenders procedure was abolished. Therefore, implementing rules referring to the calls for tenders should be deleted. Rules for joint setting up of young farmers have been introduced in Article 2(1)(n) of Regulation (EU) No 1305/2013 and a definition of the ‘date of setting up’ has been added in Article 2(1)(s) of that Regulation. Therefore, provisions referring to the young farmer set out in paragraph 8 of Part 1 of Annex I to Implementing Regulation (EU) No 808/2014 should be aligned. Moreover, following the deletion of Article 57 of Commission Implementing Regulation (EU) No 809/2014 (4) containing rules on Farm and business development, the rules for business plan laid down in Implementing Regulation (EU) No 808/2014 should also be simplified. The rules on financial instruments have been simplified. Notably, a derogation from the applicability of selection criteria for operations supported through financial instruments has been introduced in Article 49(4) of Regulation (EU) No 1305/2013. Paragraph 8 of Part 1 of Annex I to Implementing Regulation (EU) No 808/2014 should be aligned with this derogation. In order to avoid unnecessary administrative burden and in particular frequent modifications of the financing plans, it is necessary to clarify that the capping related to the overrun of the planned EAFRD contributions as presented in the financial plan of each programme is calculated at the level of the total amount of each measure. Article 39a of Regulation (EU) No 1305/2013 provides for support to farmers through a sector specific income stabilisation tool and Article 37 of that Regulation allows for support to agricultural insurance schemes covering production losses exceeding 20 % of an annual average caused by adverse climatic events, animal or plant diseases, pest infestation, or an environmental incident. In accordance with Article 8(1)(h) of Regulation (EU) No 1305/2013, the financing plan should indicate the planned EAFRD support and the contribution rate. Implementing Regulation (EU) No 808/2014 should therefore be amended accordingly. (1) OJ L 347, 20.12.2013, p. 487. (2) Commission Implementing Regulation (EU) No 808/2014 of 17 July 2014 laying down rules for the application of Regulation (EU) No 1305/2013 of the European Parliament and of the Council on support for rural development by the European Agricultural Fund for Rural Development (EAFRD) (OJ L 227, 31.7.2014, p. 18). (3) Regulation (EU) 2017/2393 of the European Parliament and of the Council of 13 December 2017 amending Regulations (EU) No 1305/2013 on support for rural development by the European Agricultural Fund for Rural Development (EAFRD), (EU) No 1306/2013 on the financing, management and monitoring of the common agricultural policy, (EU) No 1307/2013 establishing rules for direct payments to farmers under support schemes within the framework of the common agricultural policy, (EU) No 1308/2013 establishing a common organisation of the markets in agricultural products and (EU) No 652/2014 laying down provisions for the management of expenditure relating to the food chain, animal health and animal welfare, and relating to plant health and plant reproductive material (OJ L 350, 29.12.2017, p. 15). (4) Commission Implementing Regulation (EU) No 809/2014 of 17 July 2014 laying down rules for the application of Regulation (EU) No 1306/2013 of the European Parliament and of the Council with regard to the integrated administration and control system, rural development measures and cross compliance (OJ L 227, 31.7.2014, p. 69). In order to ensure uniform conditions for the calculation of technical provisions and basic own funds by insurance and reinsurance undertakings for the purposes of Directive 2009/138/EC, technical information on relevant risk-free interest rate term structures, fundamental spreads for the calculation of the matching adjustment and volatility adjustments should be laid down for every reference date. Insurance and re-insurance undertakings should use the technical information, which is based on market data related to the end of the last month preceding the first reporting reference date to which this Regulation applies. On 5 July 2018, the European Insurance and Occupational Pensions Authority provided the Commission with the technical information related to end of June 2018 market data. That information was published on 5 July 2018 in accordance with Article 77e(1) of Directive 2009/138/EC. Given the need for the immediate availability of the technical information, it is important that this Regulation enters into force as a matter of urgency. For prudential reasons it is necessary that insurance and reinsurance undertakings use the same technical information for calculating technical provisions and basic own funds irrespective of the date on which they report to their competent authorities. This Regulation should therefore apply from the first reporting reference date to which this Regulation applies. 1. Insurance and reinsurance undertakings shall use the technical information referred to in paragraph 2 when calculating technical provisions and basic own funds for reporting with reference dates from 30 June 2018 until 29 September 2018.
for each relevant national insurance market, the volatility adjustments set out in Annex III. It shall apply from 30 June 2018. (2) Regulation (EU) No 182/2011 of the European Parliament and of the Council of 16 February 2011 laying down the rules and general principles concerning mechanisms for control by Member States of the Commission's exercise of implementing powers (OJ L 55, 28.2.2011, p. 13).